September is here and change is abound. For months we've been concentrating on the bright southern constellations like Crux, Centaurus, Scorpius and Sagittarius. Scorpius and Sagittarius are still around but now its time for these constellations to gradually move aside for some of the brightest stars in the northern part of the sky like those of Aqulia Cygnus and Lyra, which include the Summer Triangle. 1) Delphinus – a small constellation representing a Dolphin. Visible to the naked eye and binoculars. 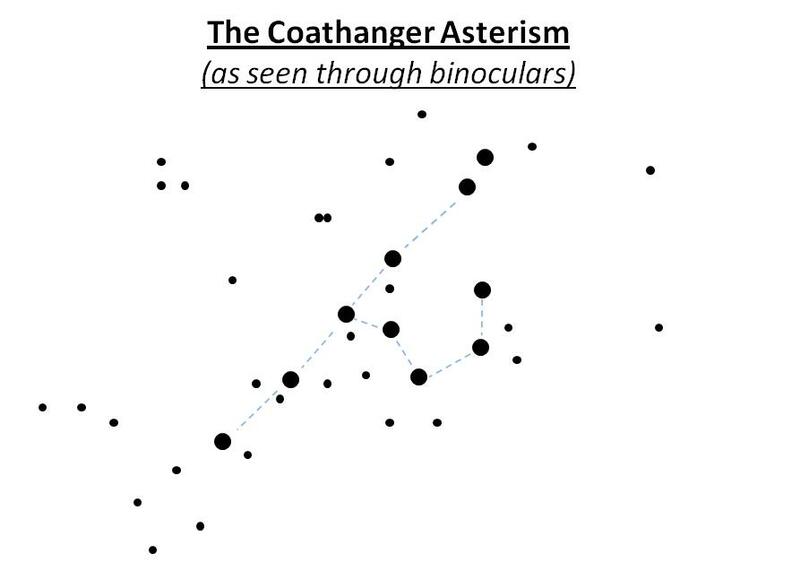 2) Coathanger Asterism (Brocchi’s Cluster) – A small group of 10 stars in the shape of a coathanger. Requires binoculars or small telescopes. Located in the faint constellation of Vulpecula. 3) Dumbbell Nebula (M27) – a Planetary Nebula, gas cloud formed from the other layers of a dying star. 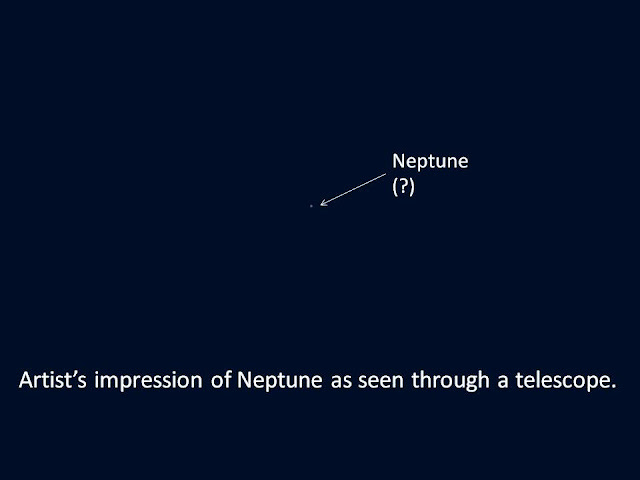 Appears as a faint misty ellipse using low magnification. 4) Albireo (Beta Cygni) – a colourful double star, yellow and blue in colour. Requires telescope. 5) Ring Nebula (M57) – A faint planetary nebula in the shape of a ring or halo. Appears misty in small telescopes. 6) Double-Double (Epsilon Lyrae) – Four stars arranged in pairs, very close together. 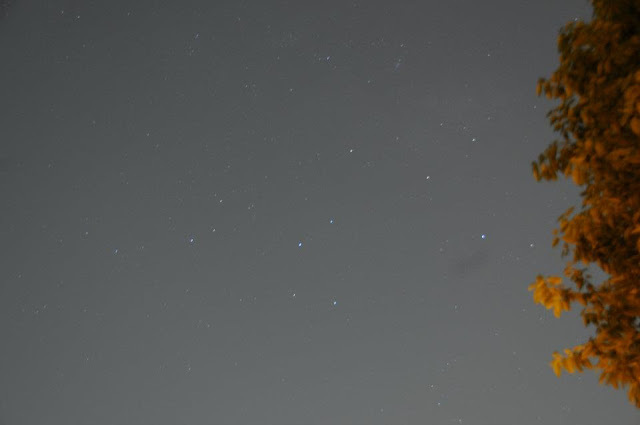 Larger telescopes and high magnifications are need to separate each pair to see all four stars. 600 light-years away. 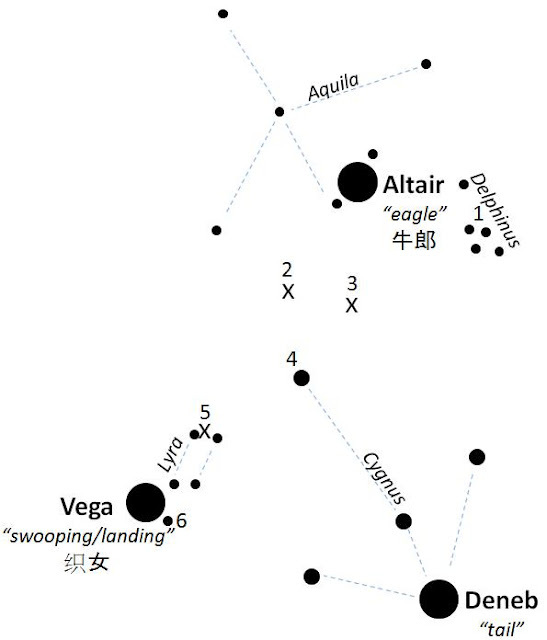 Some my favourite targets within these constellations are double stars like the colourful Albireo (beta cygni) and the Double Double (epsilon lyrae), as well as a faint collection of stars known as the coathanger asterism (among other names). Visible in binoculars or a finderscope its located near the centre of the Summer Triangle (constellation Vulpecula) and looks like a coathanger. In the unlikely event of extremely clear skies and no moon we may feel ambitious and aim for the faint glows of the Ring Nebula(M57) and Dumbbell Nebula (M27). This year, September also sees the disappearance of Saturn, but it can still be seen for a few weeks in the early evening around 8pm. Mars hangs around for a another month or two, although it now appears very tiny in telescopes. 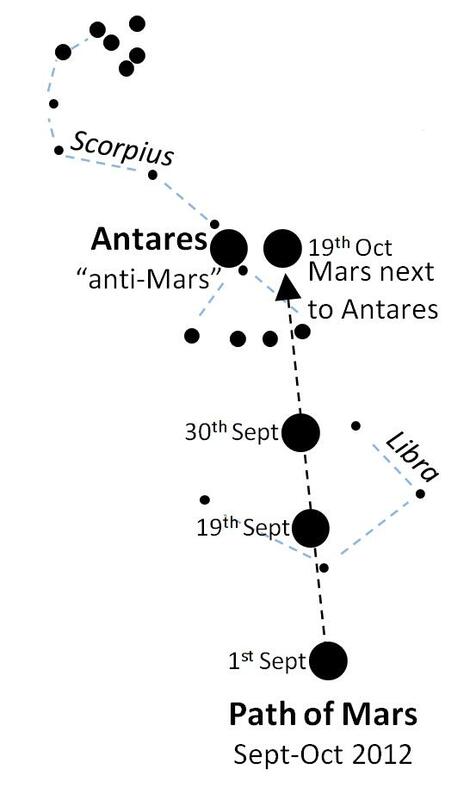 Gradually making its way across the constellation Libra, Mars will eventually end up in front of Scorpius, next to the bright red star Antares. 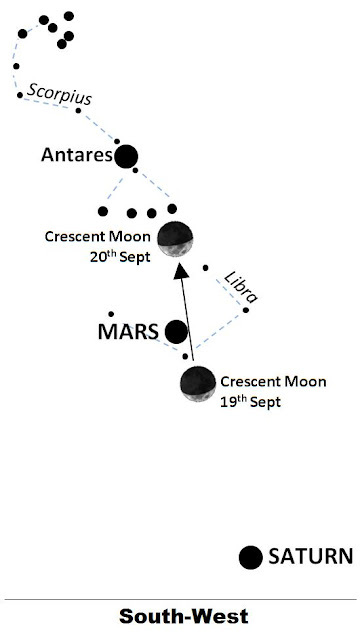 Antares gets its name from Mars, as "Ares" is Greek for Mars, therefore Antares literally means "Anti-Mars" as they both appear similar in colour (red/orange). Neptune and Uranus are at their closest position to Earth right now. 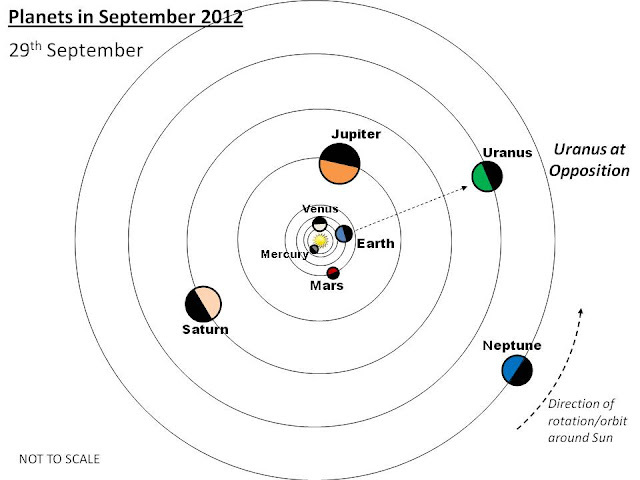 Neptune was at opposition (in direct alignment with Earth) on 24th Aug and Uranus will reach opposition on 29th Sept. 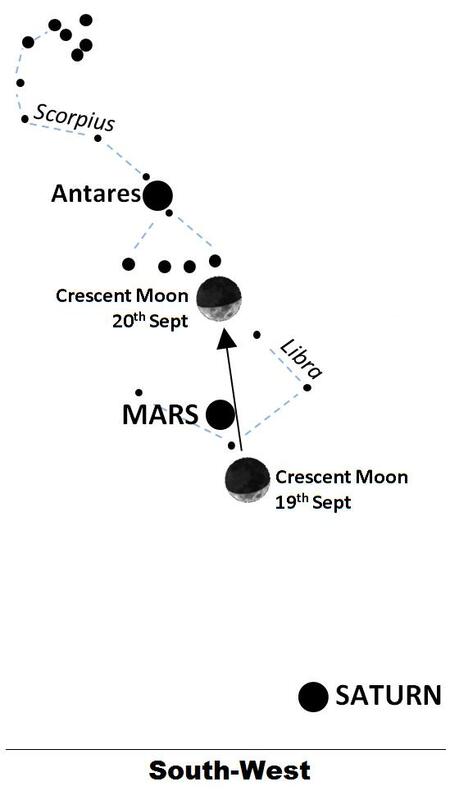 The best time to view the Moon during our Friday Night Stargazing session will be 21st Sept (Crescent Moon) and 28th Sept (Gibbous Moon). Finally 30th September is Mid Autumn Festival 中 秋 節 - Full Moon/15th day of 8th lunar month (Chinese Lunar Calendar), a time for family celebrations, lanterns and mooncakes. What's special about this Full Moon is that it's the closest Full Moon to the Autumnal Equinox (22nd Sept, where night and day are equal length). 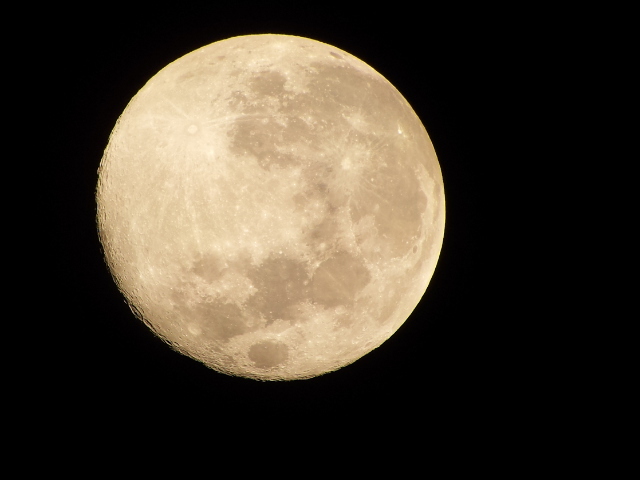 A common assumption about mid-autumn is that the Full Moon is at its biggest or brightest, which is not the case. Lunar festivals usually have some seasonal significance. For mid-autumn, its harvest time in the northern hemisphere. The orientation of the Earth during Equinox causes the Moon to rise at a smaller angle and stay in the sky slightly longer (roughly12-13hours) than in previous months. Therefore, warm autumnal temperatures and long moonlight hours make this full moon the ideal time for night harvesting, before the cold winter weather arrives. In Europe, the autumnal Full Moons are called Harvest Moon and Hunter Moon for similar reasons. Of course, here in Singapore, near the equator, its warm all year round and there is little or no change in the Full Moon's timing in the sky but we still in get to enjoy the festivities.